Whether you want to go hunting or just have fun in the wilderness or normal outdoor activities, you need some kinds of protection because you will never know and you will never trust that you’re going to be safe all the time. So having protection with a knife is a good starting point. Below are the knives that are high in quality and have some useful features for you and for your survival. This is a premium-built knife with a very affordable price. 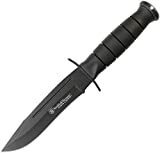 It’s a 7 inches overall length and is perfect for hunting and surviving in the wilderness. It has simple tools such as fire starter that is made of magnesium-alloy. The stainless steel blade is also wrapped in thick green cord handle and covered by nylon sheath. The Mtech MT-086 is a high quality and tough tactical knife that comes in black and digital cameo and digital tan cameo. 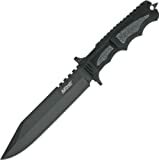 It is 12.25 inch overall length with 7 inches of blade and 5.125 inches handle. It is a pretty optimal length that is not too long or too short. The handle is made of rubber so it won’t slip out of the hand. 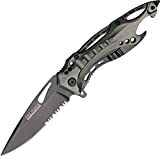 Next is the Gerber 31-000751 for the Bear Grylls Survival Series that is equipped with many things that you might need while camping or hunting outdoors. It is 13 inches long and comes along with a fire starter with integrated diamond sharpener. On top of that, it also features key ground-air communication patch and emergency micro lanyard whistle. This knife is the best emergency tool available. It fits right in the pocket perfectly. It is made from high-grade stainless steel with nylon pouch. The blade is trop point with serrated saw. It also includes LED flashlight for illuminating the dark. Other cool tools include magnesium-alloy fire starter, blade lock, window breaker, seatbelt cutter and pocket clip. This knife is for military hunting as well as for surviving in the wild outdoors. The overall length is 12 inches with 7-inch. The design is really well done with the saw back serration. The blade is black made of stainless steel which is strong and won’t rot. The sheath that comes with the blade is also strong and thick for extra protection and storage for the knife. The SCHF9 is a 6.4” blade with 5.6” handle. It is crafted from 1095 high carbon steel. The blade is a quarter inch thick which embraces its sharpness and strength. It is water resistance and can handle any weather condition. It is a trustworthy blade you can depend on in the field. The knife is secured in a snap-and-strap system in a nylon sheath. The sheath comes with attachable system with your thigh and your belt. The Tac Force TF-705 features colorful and small blades for maximum portability and convenience. It is foldable and is 4.5 inches long when closed. It also has other useful tools such as can opener, glass breaker and pocket clip. It feels sturdy and durable and is an inexpensive knife. It is highly recommended for those who go outdoors and wild for fun. Smith & Wesson CKSUR1 Bullseye Search and Rescue Fixed Blade Knife is the fixed blade knife that has 5.88 inch bade and 10.5 inch in total length. It is made out of 440 stainless steel with grooved blade and non-reflective black coating and rubber wrapped on the aluminum handle. This product includes limited lifetime warranty making you have more confidence in purchasing and using. The manufacturer claims that their knife is the most famous fixed blade knife design in the world with 1095 Cro-van steel, leather handle and USMC fighting knife. It is made in America which is an assurance for quality. 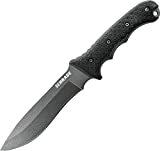 You will never go wrong purchasing this knife as it is super sharp and light that you can use it to wipe down any type of obstacle in your way. Lastly, Ontario 499 Air Force Survival Knife is something that you shouldn’t miss either. 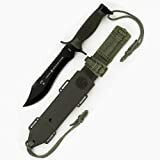 It is US Army and Air Force –issue knife with 5-inch blade that comes with comfortable leather handle and sheath for very durable and cool look and it also comes with sharpening stone that you can maintain the knife for the longest possible time.